We offer "Made-in-USA" Drop-in Anchors! of objects to concrete and brick. Anchor Size Outside Diameter Overall Length Thread Length Min. Embedment Drill Size *Pull Out Box Qty. pcs. variations in concrete. Anchors should be tested in specific material. loads, overhead installations, etc.) may require a safety factor of as much as 10:1, or more. Anchor spacing recommendations serve only as a guideline. Spacing will vary as the density of the masonry material changes. A safety factor of 4:1, or 25% of ultimate, should be used. Critical applications (vibratory loads, overhead installations, etc.) may require a safety factor of as much as 10:1 or more. 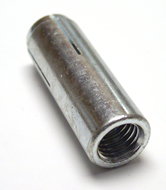 DFS Drop-In Anchors have a much smaller hole diameter requirement than lead anchors. The DFS Drop-In Anchors have much greater pull-out strength than lead anchors and lag shields. DFS Drop-In Anchors are preassembled. Ready for use right out of the box! Where do I use DFS Drop-In Anchors?